Laurelhurst Craftsman Bungalow: Quilt Top — Done!! Sharon's still debating about what to do for the backing, but the pieced quit top is done! Alas, we really don't have any piece of floor large enough to lay it out, so there won't be a good picture of it until after it's quilted and bound. This was a really fun project. 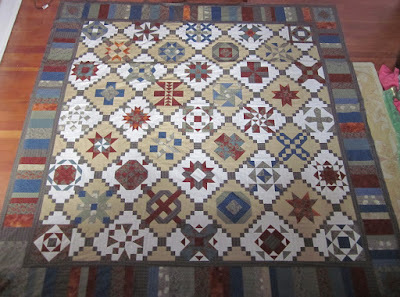 I enjoyed making all these squares that dated from 1913 and earlier.